The Costa Victoria Cruise Ship is a ‘Sky-Class’ Cruise Ship owned and operated by Italian Cruise Line, Costa Crociere. With a capacity for nearly 2,000 passengers, the ship offers passengers various luxurious cabins to choose from, with 242 staterooms that have their own private balconies and 20 exclusive suites for the ultimate comfort and style. Costa Victoria has been designed with a mix of traditional and modern contemporary decor for optimum sophistication and elegance. With thousands of impressive art pieces adjourning the walls, the ship is a true reflection of traditional Italian spirit. 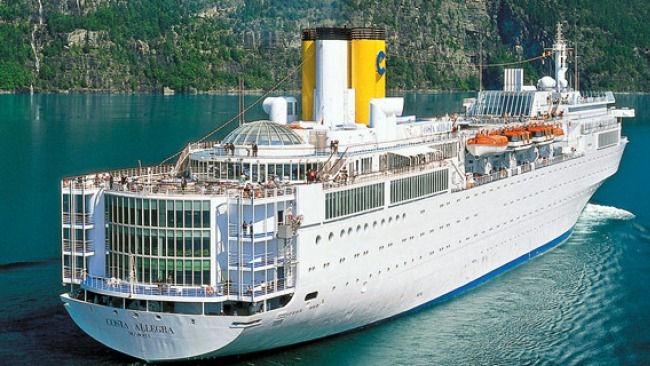 In 2004, Costa Victoria underwent a complete refurbishment with many new balconies, terraces and windows added. Presently, Costa Victoria cruises various destinations in the Far East. When it comes to dining and drinking, Costa Victoria has a whole host of bars, restaurants and cafes on offer for passengers to choose from. 5 traditional restaurants offer a variety of international cuisines from expert chefs, with menus that change on a daily basis. Passengers will love the exclusive Sinfonia Restaurant which has live piano music to listen to you as you dine on exquisite dishes. When it comes to chilling out and relaxing with a refreshing drink, Costa Victoria has many bars and lounges for guests to choose from. Many of the 10 bars also offer live music, shows and dancing in the evening. The Capriccio Dance Hall is great to unwind and relax in the comfortable chairs as you enjoy one of the shows by the talented performers, whereas the Cognac and Cigar Bar is great for a night cap at the end of the evening with a wide selection of spirits and liqueurs available. Burn some calories at the fully equipped gym, take a dip in the pool or soak up the rays on deck, however your mood takes you, Costa Victoria has something for everyone. With 3 pools, 4 Jacuzzi’s, sports pitch, jogging track, sun deck, library, card room and shopping centre, Costa Victoria has it all. Adults will love the the exclusive Pompei Spa Wellness Centre for rejuvenation and ultimate pampering with sauna, solarium, Turkish baths and treatments rooms for massages, facials, acupuncture, body warps and much more. Kids big and small will love Costa Victoria with numerous activities taking place every day. With various sports, video arcade, swimming pools, the Squok Club for little ones and the funky teen zone for older kids where teenagers can hang out and watch movies on large TV screens, try new activities or listen to all the coolest tunes on the retro Juke box. In addition to the numerous bars and lounges hosting nightly shows, dancing and live music, passengers can also visit the exclusive 2-level theatre, disco or on-board casino for evening entertainment. The Festival Theatre has a whole host of shows, musicals and live music each evening from talented performers around the world. The Montecarlo Casino has many thrilling games for both the experienced passenger and first time casino visitors, including fruit machines, poker, black jack and roulette.